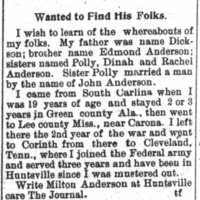 Anderson has not seen his family since 1863. 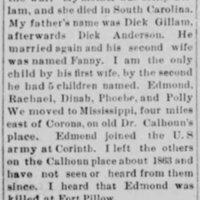 His brother, Edmond, killed at Fort Pillow, during the Civil War. Left for Keyton, Alabama [ca. 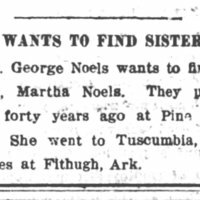 1906] and not heard from since. Searcher is W.M. 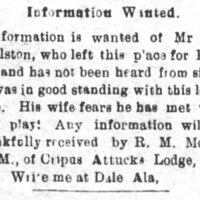 [Worshipful Master] of Crispus Attucks Lodge No. 122. [a black Masonic lodge], Dale, Alabama. Gholston was a member of this lodge. 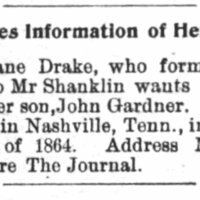 Mrs. Drake last saw her son in Nashville, Tennessee, in 1864 [during the Civil War]. 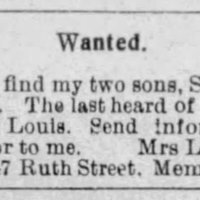 She formerly belonged to Mr. Shanklin. 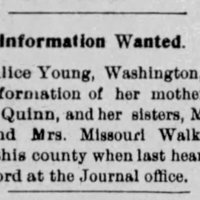 Young, of Washington, DC, is searching for her mother, Mrs. Candace Quinn, and sisters, Mrs. Ella Barby and Mrs. Missouri Walker. 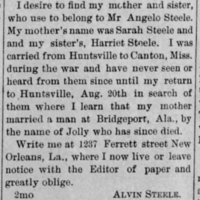 Alvin Steele was carried from Huntsville, Alabama, to Canton, Mississippi, during the Civil War. 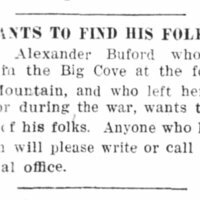 He returned to Huntsville in 1895 in search of his mother and sister. Searching for Hezekiah, William Capers, Robert, and Laura. 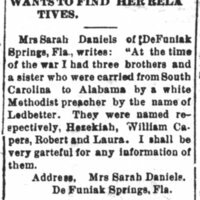 A white Methodist preacher named Ledbetter carried them from South Carolina to Alabama at the time of the Civil War.